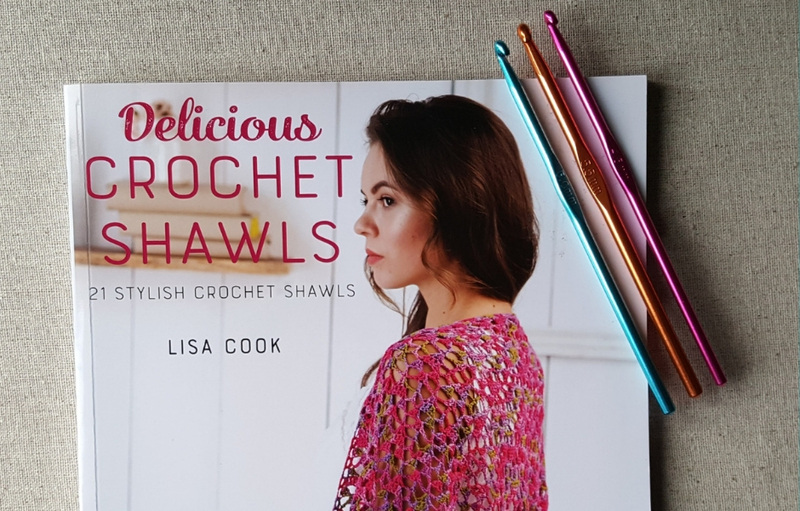 I hadn’t planned on buying a book about crochet shawls, as I already have a very large Pinterest board dedicated to this type of accessory. But I recently went to my local branch of The Works to pick up a stationery order, and on arrival, I was given a discount voucher to spend on the day, so it would have been rude not to browse while waiting for my parcel to be retrieved from the storeroom! I flicked through a few crochet books, but none caught my attention until I got to Delicious Crochet Shawls. It was a winner for me because… it contained charts! The concept of the book, as explained by the author herself, originated in her love for sweets treats consumed in tearooms up and down the UK. Consequently, each crochet shawl has a mouth-watering name, like “Banana Split”, “Blueberry Muffin” or “Raspberry Ripple”. Although the author is British, the book is “sponsored” by Cascade Yarns, an American brand, so US terminology is used throughout. The book starts with a lovely double page spread showing all 21 designs, before diving straight into the patterns. Each pattern is split into three sections. First, all the expected indications are given: materials, gauge (US word for tension), finished measurements, instructions for “special stitches” (although I wouldn’t personally say that a front post stitch is a “special” stitch, but it is always good practice to assume that the reader’s knowledge is limited). A full-page picture and a couple of smaller ones show each shawl under different angles to better appreciate their design. The written pattern is given over the next couple of pages. With a layout of 2 columns per page, some rows consist of up to 12 lines of dense, heavily abbreviated instructions, with no line returns. Urgh! I find it quite frankly dreadful, and I will never understand why any publisher would do that. Thankfully, the chart pages are next. Most of the shawl charts are divided into sections, to avoid having to shrink the stitch symbols so small that they would simply be illegible. These charts are very clear and use two or more colours, always with different colours for consecutive rows. However, there is no mention of the actual yarn colour changes on the chart pages, which means that you have to search in the written instructions for the rows starting with “Using Color A…” or “With Color B…” to know when to change colour – assuming that you want to follow the exact colour changes of the original, but as patterns are just guidelines, never fear doing your own thing! The Techniques section at the back of the book is succinct and of inconsistent quality: some of the crochet instructions are very well thought-out, while others are rather confusing – once again proving the point that most designers are not teachers! I love this book because it offers a varied selection of shawl shapes and construction techniques: bias triangles, top-down triangles, rectangles (I guess I’d call these wraps? ), half-hexagons and half-circles. It is a solid reference for crocheters looking to learn how to make different types of shawls and a great resource to get inspired and design one’s own crochet shawls after exploring the author’s creations. You can check out all 21 designs on the book’s Ravelry page. Who needs a yarn diet?